The Swedish writer Ulf Stark (nominated to the 2011 Astrid Lindgren Memorial Award) travelled to the West Bank last year. In the Palestinian territories, his book Can you whistle, Johanna? is very popular and he was invited to read from the book and speak about his work. During his visit he also met with the Tamer Institute for Community Education, the organization which won the 2009 Astrid Lindgren Memorial Award for its tireless work to promote reading among children and youth on the West Bank and Gaza. While traveling through the West Bank, Ulf Stark came up with the idea of a new book: Pojken, flickan och muren (The boy, the girl and the wall). Following his trip, the illustrator Anna Höglund (nominated to the 2011 Astrid Lindgren Memorial Award) also visited the West Bank to collect inspiration and to make sketches for illustrations to Ulf Stark’s text. And now, less than a year later, the result of the trips is here: A beautiful and poetic tale about two children’s resourcefulness living in the shadow of a wall. Pojken, flickan och muren is published in Swedish by Berghs Förlag and in Arabic by Dar Al Muna simultaneously – an unique publishing project for an unique book . The New Zealand Book Council wants to inspire New Zealanders to read more. Their flagship program Writers in schools provides free writer visits for over 50 000 children every year. Also, the New Zealand Post Children’s Book Award Finalists for 2011 were announced today. A list which makes a good starting point to learn more about contemporary children’s books from New Zealand. Among the finalists in the picture book section we find The Moon & Farmer McPhee by Margaret Mahy (nominated to the 2011 Astrid Lindgren Memorial Award) and David Elliot. The winners will be announced in May. On our home page we now counting down to the announcement of the 2011 Astrid Lindgren Memorial Award. At the time of writing, it is 36 days, 16 hours, 25 minutes and 5 seconds until we know who the jury will select as this year’s winner. The announcement will take place at 1 pm on the 29th of March in Vimmerby. It will be broadcasted live to Illustrator’s Café at the Bologna Book Fair, as well as on our home page. In March Swedish picture book connoisseurs can finally enjoy Kitty Crowther’s L’enfant racine in their own language. Rotbarnet is published by Berghs Förlag in a translation by Gun-Britt Sundström. L’enfant Racine is the dreamlike story about Leslie, a lonely woman living in the forest who tries to catch a fox which has taken three of her hens. She follows the traces of the fox deep in the forest where she meets a creature looking like a root crying on a stone. The Root Child in L´enfant racine (2003) is an enigmatic creature, perhaps the very root of life, who gives meaning and direction to the life of Leslie, the protagonist. It is noteworthy that, in this capacity, the Root Child is a complex character, both lovable and trying. In Kitty Crowther’s world there are no basic stereotypes. Soon, the award office will publish a reader’s guide to the book on this page where we already have reader’s guides to books by Sonya Hartnett and Maurice Sendak. We recently spent an evening at the center of art and film KinoKino in Sandnes, just outside of Stavanger. Currently, KinoKino is housing the exhibition Serieglobus, comic book artists’ view on the conflicts of the world. The exhibition is curated by Morten Harper and features work by international artists such as Marjane Satrapis (Persepolis), Ted Rall (The Afghan Sketchbook), Guy Desisle (Burma Chronicles) and Art Spiegelman (Maus). But seeing Serieglobus was just an added bonus to our visit as our main purpose was to see the screenings of three new animated films: The Lost Thing based on the book by Shaun Tan (Nominated to the 2011 Astrid Lindgren Memorial Award), Angry Man based on the book by Gro Dahle and Svein Nyhus (Nominated to the 2011 Astrid Lindgren Memorial Award) and A Town called Panic by Belgian animators Vincent Patar and Stéphane Aubier. The Lost Thing is a beautifully animated film, true to the spirit and rhythm of the Shaun Tan’s reto-futuristic book. Angry man came about as a project to empower children who grow up in families suffering from domestic violence. Both the book and the film have been in the Norwegian Red Cross’s programs to raise awareness against domestic violence. Directed and produced by Anita Kill, it has already received several international short film awards. Finally, A town called Panic, is a hilariously anarchic animation! The Belgians already have a strong cult following in their home country and it would be surprising if their original sense of humor won’t conquer the rest of Europe. 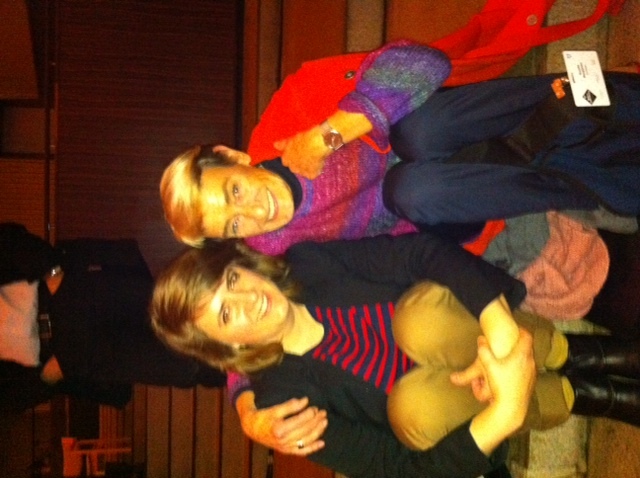 Two happy filmlovers in the audience: 2010 Astrid Lindgren Memorial Award recipient Kitty Crowther together with Swedish picture book artist Gunilla Bergström. Twin brothers Svein Nyhus and Egil Nyhus captivated the audience when they presented their work at Maktens Pluttifikasjon in Stavanger. Illustrating twins aren’t an exclusivity for Norway. In Sweden, Lisen Adbåge and Emma Adbåge (also present in Stavanger) booth have successful careers as picture book artists. But the interesting thing about the Nyhus brothers are that they work in very different fields of picture book illustration. This became very apparent in their presentation. Svein Nyhus counts as one of the great innovators of Norwegian illustration. In fact, he is nominated to the 2011 Astrid Lindgren Memorial Award together with writer Gro Dahle. Egil Nyhus, on the other hand, has chosen a more commercial path, illustrating the hugely successful Kaptein Sabeltann series. In other words, Egil Nyhus route has been much more lucrative. So far. In case Svein Nyhus actually receives the 5 million SEK Astrid Lindgren Memorial Award this will change overnight. But Egil Nyhus need not to worry. He showed a signed contract that guarantees him half the award total in case his brother wins! In any case, we are sure to hear more from these highly talented and productive brothers. 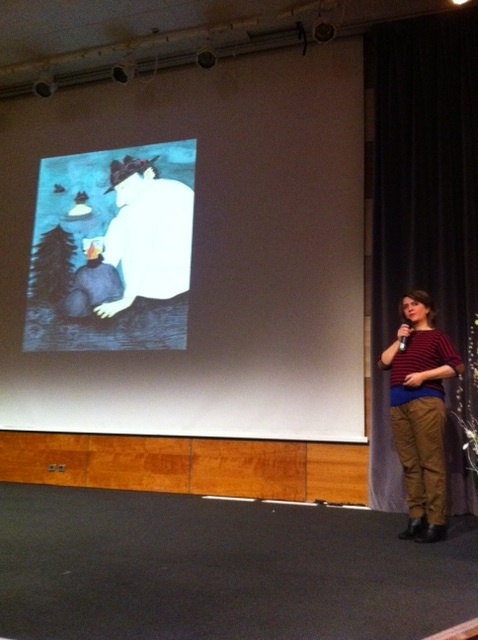 The 2010 Astrid Lindgren Memorial Award recipient Kitty Crowther opened the Stavanger conference early on Tuesday morning. When talking about her work she explained how she sees herself like a film maker who doesn’t know how the film will end when starts shooting. Kitty Crowther first selects the actors, the characters, and then stays sensitive to the story as the work on the book progresses. Good news for Norwegian fans is that two books by Kitty Crowther will be published in Norway in 2011, by Cappelen Damm: Le petit homme et Dieu and Poka & Mine: Le football. Maktens Pluttifikasjon, the Nordic children’s literature conference is well underway. What makes the conference special is the breadth of participants and topics, all sectors of children’s literature are represented: librarians, teachers, authors, illustrators, researchers, publishers, translators and last but not least – the super readers, youngsters who aren’t shy to give their opinion. The conference opened with a reading of the funny and thoughtful picture book Odd er et egg (Odd is an egg) by Lisa Aisato. Maria Nikolajeva, professor at Cambridge University, held the opening lecture in which she spoke about knowledge and power. An interesting lecture, where prof. Nicolajeva gave examples of how children’s literature can be used as an instrument of power and how the adult writer has the potential to manipulate the child reader through artistic means. With the conference name Maktens Pluttifikasjon, referring to Pippi Longstocking, in mind Agnes-Margrehte Bjorvand from the University of Agder showed how Astrid Lindgren borrowed and reused material from herself. Themes, characters and scenes in her earliest works, the short stories she wrote for monthly magazines, reappears in her later books. We also had the opportunity to listen to Danish writer Fatima A. Alatraktchi, who wrote her first novel at the tender age of fourteen. The dystopic novel received critical acclaim for its realistic depiction of power struggles in school, paralleled in the world at large. In 1961, Larry and Nina Chertoff’s childhood room on Manhattan was decorated with a mural, by no other than Maurice Sendak (2003 recipient of the Astrid Lindgren Memorial Award). Picturing a parade of children and animals, it is the first and only mural Maurice Sendak has painted. The mural predates his groundbreaking picture book Where the wild things are with a couple of years. Now, 50 years after it was painted, the mural has been removed from the Chertoff’s apartment and transported to the Rosenbach Museum and Library, which houses the Sendak Gallery. It is currently being restored and will soon be shown to the public. Friends of the work of Maurice Sendak, will surely recognize the little white dog leading the parade. It is Maurice Sendak’s own dog, Jennie, who appears in the books Kenny’s Window (1956) and What do you say, dear (1958). Jennie also plays the role of Max’s dog in Where the wild things are. Also in the parade, you’ll find Rosie from The sign on Rosie’s Door (1960) and the bear from The Little Bear Series. In February and March, visitors to the Rosenbach are able to follow the conservation process in progress and meet the specialists working on the mural. You can listen to Maurice Sendak talking with Larry and Nina Chertoff about the mural on radio program All things considered (National Public Radio). We found this clip of Ryoji Arai (2005 Astrid Lindgren Memorial Award winner) performing a live painting. See how the painting develops and tells a story through its quick transformations!